Take a look at the services we offer. High output roller finishing mower. Offers a premium cut on Sports and Recreation fields. The Wessex RMX TRI-DECKS are in a league of their own, with independent float on all decks, independent wing control, rear deck pivot, and a premium cut and an even distribution of the grass cuttings. 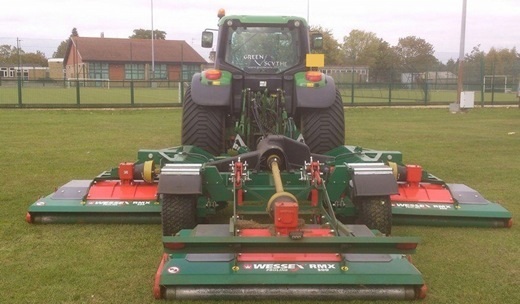 With our 5.6 m machine we are able to mow any size sports field quickly and efficiently. Please call for more details on how a seasonal gang mowing contract may be able to reduce your labour and machinery costs and ask for a no obligation quotation for the 2017 season. Call us to arrange a site survey or quote with one of our team. © 2019 Grounds maintenance | Oxfordshire | Green Scythe All Rights Reserved.